I'm a huge fan of polenta. It's rich, creamy, warm, and comforting, and the perfect blank canvas to work with. I almost always add a nice handful of cheese to the mix (think cheesey grits), sometime I wilt some spinach or arugula into it to boost the health quotient, or my latest favorite add-in has been roasted butternut squash. The sweet caramelized squash marries well with the wholesome sweet cornmeal. Not only is polenta delicious, it is also very forgiving, as I learned from Joyce Goldstein, who taught me how to make a pumpkin polenta with pork and chestnut stew. As Goldstein says, unlike risotto, which you have to serve right away, polenta you can baby, and keep it on the stove until you're ready. Another reason I love polenta so much is for its versatility. You can serve it freshly made, while it has the consistency of warm pudding. Or, you can chill it in a baking sheet, and then cut it out into shapes (squares, triangles, strips, rounds, whatever you desire) to pan fry into the best leftovers you've ever had. 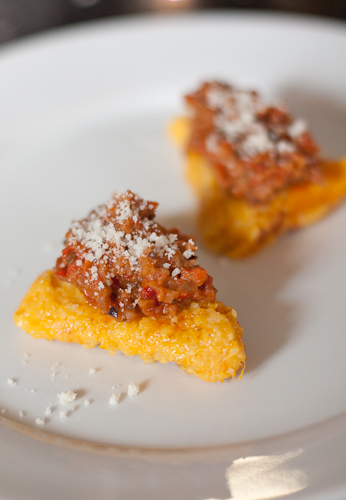 For my freshly made version, I paired my butternut squash polenta with a deceptively easy pulled pork. I started with a lean and inexpensive cut of pork tenderloin, and seared it off so that a nice golden crust formed on both sides. Then, the aromatics (onion and garlic) and spices (chili powder, cumin, cinnamon, cayenne) are introduced. The cinnamon and cumin in particular add a great smoky-sweet dimension, while the chili and cayenne bring some heat. Now for the tang. Ketchup and apple cider vinegar create the acidity that really flavors the meat. The pork is shredded and then left to simmer in the sauce. The sweet richness of the butternut squash polenta provides the perfect accompaniment for this tangy, saucy pulled pork. Now, for the leftover polenta! Pan-fried polenta cakes make for the perfect hors d'oeuvres because you can top them with virtually anything. I love topping my butternut squash polenta cakes with a roasted veggie spread made with eggplant, red peppers, red onion, and tomato paste. Best of all, you can make this dish ahead of time. The veggie spread can be whirred up the day before and kept in the fridge. And, the polenta cakes can even be cut up ahead of time and kept under plastic wrap. When you're ready to assemble, simply dust the polenta cakes with a flour/cornstarch mix to make sure they get a nice crust, and you're good to go. If the idea of jockeying for a reservation at an expensive restaurant on 2/14 makes you cringe, why not spend Valentine's Day at home and cozy up to a romantic meal made with love. Whether it's a homey dish of Butternut Squash Polenta with Pulled Pork, or a fancy looking appetizer of Butternut Squash Polenta Cakes with Roasted Veggie Spread, polenta will be sure to earn you some big points with your honey. 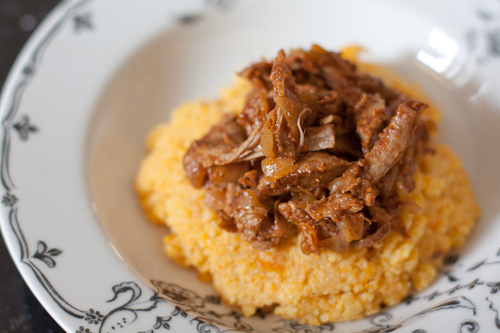 The sweet richness of the butternut squash polenta provides the perfect accompaniment for the tangy, saucy pulled pork. In a large pot heat the oil over medium heat. Season the pork with salt and pepper. Add the pork to the pot and sear both sides, flipping only once so that a nice golden crust forms. Remove the pork and set aside. Add the onion and garlic to the pot and season with salt and pepper. Cook until softened and lightly browned (about 5 minutes). Add the chili powder, cumin, cinnamon, and cayenne and cook until toasted (1 minute more). Stir in the broth, ketchup, vinegar, and brown sugar. Bring to a simmer and add the pork. Simmer, covered, until the pork is just cooked through and tender (about 20 minutes). Remove the pork to a cutting board and let stand for 5 minutes. Increase the heat on the remaining sauce in the pot to medium-high and cook until thickened (about 5 minutes). Remove from the heat. Shred the pork with two forks into large chunks and add back into the thickened sauce. Toss well to coat. Let stand 10 minutes, tossing occasionally, to let the pork absorb the sauce. Peel the squash, cut it in half, scoop out the seeds, and cut into 1-inch cubes (Tip: microwave the entire squash for a few minutes so that it's easier to cut into). Place the squash on a foil-lined baking sheet and drizzle with olive oil. Sprinkle with salt and pepper and roast until soft and edges are lightly browned (30-40 min). Set aside. Combine polenta and cold water in a large saucepan or pot. Bring to a boil. Reduce heat and simmer over low heat, stirring often, until thickened, about 15 minutes. Mix in squash and stir, mashing up the squash. Continue cooking until the cornmeal is no longer grainy on your tongue (about another 15 minutes); add more water if needed if the polenta becomes too thick. Mix in the parmesan and season with salt and pepper to taste. Stir in butter to finish. Note: To make polenta cakes with leftovers, spread the polenta evenly onto a sheet pan lined with parchment paper. Allow to cool, then cover with plastic wrap and refrigerate until you're ready cut into shapes and pan fry. If you've already refrigerated your leftover polenta, skip to Step 6. Spread the polenta evenly onto a sheet pan lined with parchment paper. Allow to cool, then cover and refrigerate overnight. Cut the polenta out in squares. Dust both sides with the flour/cornstarch mixture. Heat up some oil in a frying pan and fry the polenta squares, flipping once, so that a browned crust forms on each side. Cut into triangles, top with a spoonful of Roasted Veggie Spread, and sprinkle with grated Parmigiano. Serve immediately. Cut the eggplant, bell pepper, and onion into 1-inch cubes. Toss them in a large bowl with the garlic, olive oil, salt, and pepper. Spread them on a baking sheet. Roast for 45 minutes, until the vegetables are lightly browned and soft, tossing once during cooking. Cool slightly. Place the vegetables in a food processor, add the tomato paste, and blend until everything is pureed. Season with salt and pepper to taste.